So how much money did you spend on Star Wars toys on Force Friday? A couple hundred bucks? It might seem like a small fortune when your credit card bill finally arrives, but it’s nothing compared to Devon’s new Empire-themed timepiece. If you thought Sphero’s $150 BB-8 toy was an indulgence, few Star Wars collectors will be lucky enough to buy Devon’s latest creation; only 500 are being produced, and each one will cost $28,500. Disney doesn’t mess around when it comes to cashing in on its franchises. 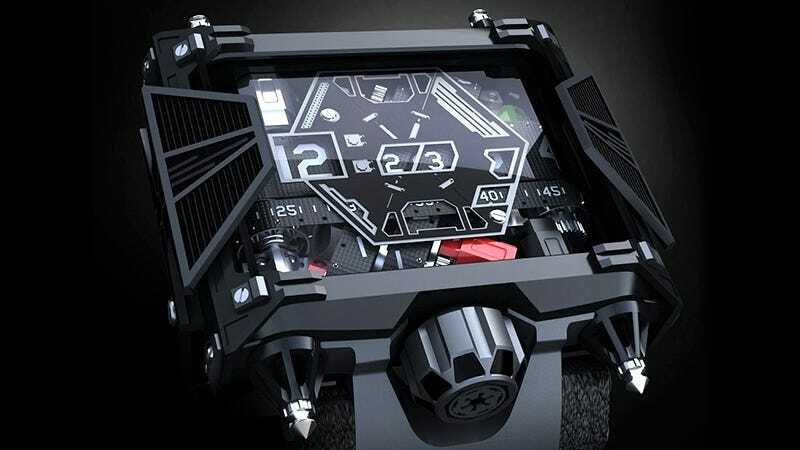 But surprisingly, even though it’s priced similar to a new car, the Devon Star Wars Limited Edition watch isn’t a completely original creation. It’s actually the original Devon Tread 1 that’s been upgraded with some Star Wars flare including TIE fighter wing accents on the sides, the Imperial crest on the crown, and spaceship-like plating over the watch’s face. That being said, if you’re a horological aficionado with a soft spot for Star Wars, you’re still getting an impressive piece of engineering to strap to your wrist here, even if it wasn’t redesigned from the ground up with Vader in mind. And as you count down the minutes until Star Wars: The Force Awakens premieres, would you rather be staring at this, or your dollar store Casio?